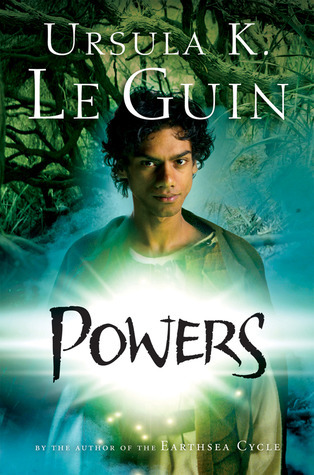 I read the third book in the Annals of the Western Shore trilogy - Powers by Ursula Le Guin. Interesting trilogy, but would only recommend to those who are motivated to try U Le Guin with this series. 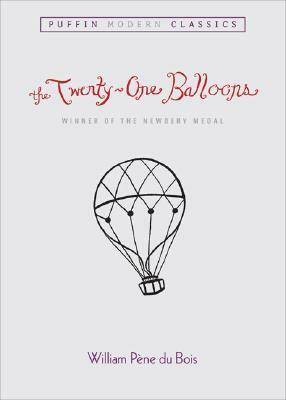 The 1948 Newbery read Winner The Twenty-One Balloons by William Pene du Bois. This was a lot of fun and adventure - great tall story. I liked how it began at the end and then went back and told the story of howProfessor Sherman found himself floating in the Atlantic with 21 balloons. I would happily recommend this to readers in my class. 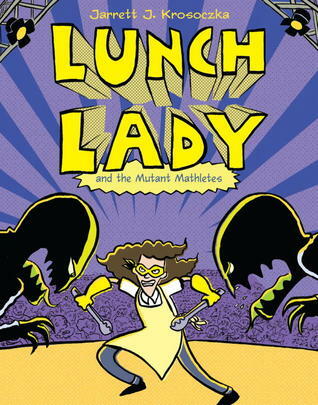 This book was a quick and easy read and my first with the lunch lady. A load of fun and I hope some of my students really enjoy it. In the coming week I plan to read Kira-Kira by C Kadohata, 2005 Newbery, noticed one of my students reading it, so thought I would grab it after her. 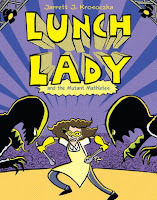 Probably another Lunch Lady book and then I am not sure. I see a notice from local library saying A Wrinkle in Time has become available for me to pick up - so I guess that's on the agenda too. 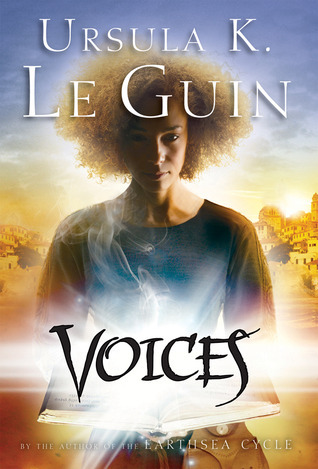 I read the second in the Annals of the Western Shore trilogy - Voices by Ursula Le Guin. I didn't enjoy this as much as the first one, it is set about 15 or so years after the first book. We did meet up with the two main characters from the first book who have travelled widely since last met. They arrive at a place that has been conquered by a people who believe reading is evil and all books have been banished and destroyed. Anyone found with a book is punishable by death. Memer however along with her mentor still holds a library and she has learned to read. When Orrec and Gry arrive that is when life begins to change and the people unite and push back at their oppressors. 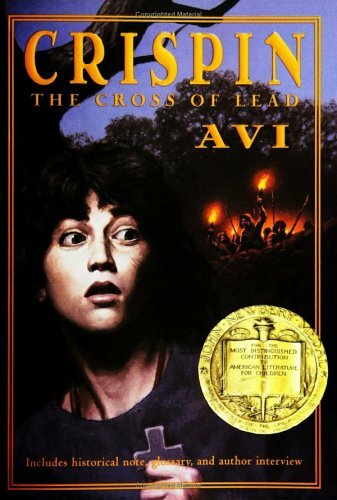 I also read the 2003 Newbery Medal book - Crispin The Cross of Lead by Avi. It was set in medieval England and told the story is about Crispin who has to be very on his guard as he escapes evil people who do not want him to live. I enjoyed it, there are other books that follow in a series from this book, but I am not likely to read them at this point. For the coming week I intend reading: Powers by Ursula Le Guin - the third book in the trilogy. If I have time I will also read another Newbery book - back to school this week for our third term of eleven weeks, so will wait and see how my stamina is by evening! 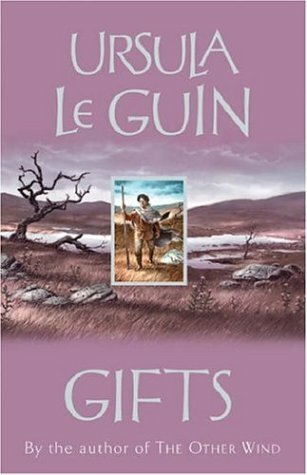 Gifts by Ursula Le Guin is the first in a trilogy, and is about Orrec and Gry, who live in the Uplands. The different clans have gifts that they pass on through father/son, mother/daughter. These gifts are to be used in the service of their community. As Orrec and Gyr grow they learn about their gifts and they come to realise that their gifts can be viewed in a different light. Gry has the gift of calling - animals - so that they come for the hunters. Orrec supposedly has the gift of unmaking - with a glance of his eye he can unmake (kill) a person. As they learn about and wrestle with their gifts they grow in their understanding of who they are and who they want to become. It took me awhile to get into the book, but at some point I slipped into it, and lost myself to the world around me and entered the world of Orrec and Gry. For some reason I always thought Ursula Le Guin was British, but I see I am wrong and she is an American. This book has made me want to go back and reacquaint myself with the Earthsea books as it is at least twenty if not thirty years since I read them! 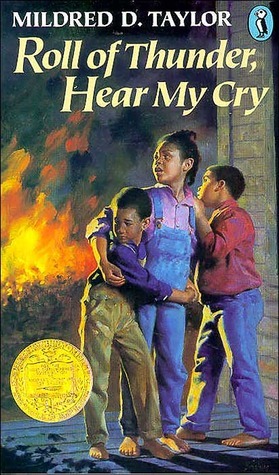 Roll of Thunder, Hear My Cry, Newbery Award Winner 1977, by Mildred D. Taylor was my other read for this week. I really loved this book with the delightful Cassie and the rest of her family. This family never lost their dignity and humaneness in spite of the injustice and prejudices of those around them. I borrowed this from The Stack at our public library - hardcover and well read, almost at that level where I go -" ew! too yucky dirty to read!" I want this to be available to my class so I have ordered a class copy and the next two that follow as well. I remember reading Black Like Me as an 11 or 12 year old and it opened my reader eyes to another world. I had the same kind of awakening when I read Kathryn Stockett's The Help, when it came out, it was set in a time when I was growing up in another part of the world, I kept thinking this was happening when I was alive. While it's easy to relegate these books and the issue of racism to the south in North America, yet these books ask us to examine our own treatment of the people around us, wherever we live. This week I plan to read Voices by Ursula Le Guin, the book that comes after Gifts, and I will also make a trip to the library to see if I can pick up another Newbery book to read for the challenge. A couple of Lunch Lady books have arrived so will probably read them as well. Genius Hour for Five Weeks for the Teacher. During my just finished sabbatical term, awarded by the New Zealand Ministry of Education I came across a twitter chat #geniushour. This chat has a number of teachers who have developed in their classrooms what is called a genius hour. Students are able to decide what they are going to learn about and become expert in and then do that for the hour. Denise Krebs talks about it here. I was interested in this so stayed for the chat that day. I thought it was a great idea and perhaps at some time I would like to try it out. I say perhaps as I have other plans as well, and there is always that ongoing tug between many conflicting 'good' learning activities to do in the classroom. However it got me thinking about my own experience of a ten week paid sabbatical that teachers in New Zealand may apply for - and only five of it is to be spent on professional learning, the other five is for holidaying. What a fantastic concept. I could choose what I spent my time on, I am sure everyone that takes it develops their own programme to suit them as a person. You do have to put your proposal in beforehand and if that is approved then it is up to the teacher to proceed in whatever way they like. Very self-regulated learning, which is the best type of learning I believe. I am not sure where this concept arose for teacher sabbaticals, whether it was the Unions who initiated it or what, but I sincerely hope that the New Zealand Ministry of Education continue with this practice, as I would love for every teacher in our country to be able to receive this opportunity if they so wish. I have worked in education since the seventies and it certainly felt to me that I mattered and I was valued, when I was awarded the time. I hope I used the time wisely and well. I was just into my exploration when I was regretting that I hadn't proposed that I follow a path of becoming better acquainted with children's literature. I wished I had thought about attending the International Reading Conference, however while it was always a dream of mine I forgot about it at the time of the proposal. There are always paths we don't travel, although I admit that being a reader anyway, much of the holiday time was spent reading by the fire! So in a way the best of both possibilities. Here is a summary of what I spent my time doing. As yet it is all "pie in the sky", if you like. I still need to incorporate some of this into my classroom. I realise with all the conflicting pulls for our classroom time at school I won't be able to spend the time I would like. I plan to build slowly - although I don't even have the actual plan yet - just a lot of ideas mulling around that need to be written down. As part of the five weeks I spent quite a bit of time learning how to edit a video in Premiere Elements 10. I carried the whole process through because I felt that if I am going to ask my students to do something then I should do it as well - makes me far more compassionate as they deal with the task. I find otherwise I can be too demanding - but when I do it I realise all the struggles! I made this video with my parent and staff community at school in mind as an audience. 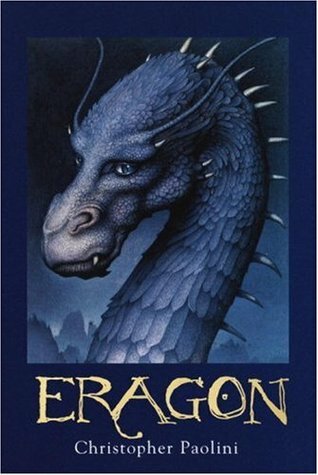 I read Eragon through the week, mainly to see why some of my students have enjoyed it. I can see that they would and I would encourage them to keep going with the series, although I will probably call it a day with this one. I loved especially the relationship between the dragon Saphira and his Rider Eragon. For me it lacked I am not sure what to call it, psychological depth - plot seemed to me to be the most dominant aspect. This week I have planned to read an Ursula Le Guin - I so loved her Earthsea trilogy, so while fossicking around in our local library looking for Newbery winners, I got sidetracked by her books and picked out Gifts to read. I also have coming Roll of Thunder Hear My Cry by Miltdred Taylor, so I hope to read that this week too, to get back on track with the Newbery books. Labels: #books, #nerdybookclub, It's Monday.